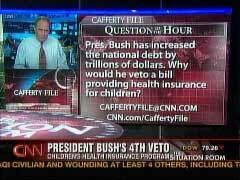 CNN’s Jack Cafferty, in a "Question of the Hour" segment on Wednesday’s "The Situation Room," offered a loaded question involving President Bush’s veto of a proposed expansion of the SCHIP program. "President Bush has increased the national debt by trillions of dollars. Why would he veto a bill providing health insurance for children?" Cafferty’s question came 10 minutes into the 5 pm Eastern hour of "The Situation Room." Before he asked that question, Cafferty detailed that President Bush’s veto of SCHIP "was cast very quietly this morning behind closed doors. No fanfare, no news coverage," and the reasons the President listed for his veto. He then added that "this is the same man who will soon go to Congress and ask for another $190 billion to continue that glorious war in Iraq." Cafferty also outlined how under President Bush’s leadership, the ceiling for the national debt has been increased for the fifth time in seven years to $9.8 trillion, and how apparently, President Bush "has borrowed more money from foreign governments and banks since taking office than this country's first 42 presidents combined." WOLF BLITZER: Let's check in with Jack Cafferty once again. He's got the 'The Cafferty File.' Hi, Jack. JACK CAFFERTY: Wolf, President Bush, who campaigned for the nation's highest office as a 'compassionate conservative,' vetoed a bill to expand children's health insurance today. That veto was cast very quietly this morning behind closed doors. No fanfare, no news coverage. The bill would have allowed an additional 4 million children to be covered at a cost of an additional $35 billion spread out over five years. $7 billion a year. And the tab would have been paid by raising the federal cigarette tax. But President Bush insisted the bill was too costly, took the program too far from its goal of helping the poor, and would encourage people covered in the private sector to switch over to government health insurance. He wanted only a $5 billion increase in funding. This is the same man who will soon go to Congress and ask for another $190 billion to continue that glorious war in Iraq. Think about this: when President Bush came into office, the federal budget was in surplus, and the national debt was $5.6 trillion. Fast-forward seven years. Mr. Bush signed a measure last week to raise the debt ceiling for the fifth time in his presidency to $9.8 trillion. Not to mention the astronomical costs of those wars in Iraq and Afghanistan, hundreds of billions of dollars, all supplemental appropriations that don't show up as part of the budget, and therefore, don't show up as part of the deficit. And in fact, statistics show that Mr. Bush has borrowed more money from foreign governments and banks since taking office than this country's first 42 presidents combined. But the children's health insurance bill was too costly. Here's the question. President Bush has increased the national debt by trillions of dollars. Why would he veto a bill providing health insurance for children? E-mail your thoughts to caffertyfile@cnn.com, or go to cnn.com/caffertyfile. Wolf? WOLF BLITZER: $5.6 trillion when he took office, the debt now another $4.2 trillion. That raises it to almost $10 trillion. Jack, I did the math for you, almost double. Thanks very much. As he does with all of his questions, Cafferty read some of the answers he received from viewers. Refreshingly, he presented arguments from both sides of the political spectrum.